Abbott government unfit to govern let alone attempt any national conversation. Canberra is notorious for its gas-baggers, blatherskites, hum-buggers, cods wallopers, and hog-washers but lately it has been in the grip of an obsession with national conversation. The phrase is on everyone’s lips. It monopolises the media. Every pollie, panjandrum, business busybody, wannabe and has-been it seems, is suddenly up for a chinwag. It’s hard to keep up with the new zeitgeist. Just yesterday, everyone was busting a gut to ‘get the message out.’ Now ‘having a conversation’ is all the rage in a puzzling turn of events laced with comic incongruity if not profound irony. And there are so many competing calls for our attention a deafening static has turned us inward. Can’t hear a word they’re saying. Even for Canberra, those appealing loudest ironically often lack the most rudimentary conversation skills, such as Tony Abbott’s wilful incapacity to listen, a fatal flaw he shares with most members of government and his opposition, public servants, public figures and a deafness of do-gooders, preachers and other eminent notables. Indeed, as a rule, those least equipped to communicate are most likely to order us to listen. Often after they have forfeited all respect. 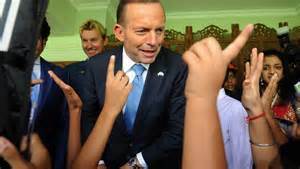 Abbott, with his own, unique empathy, attention and respect deficit disorders epitomises this flaw in his recent dealings with Joko Widodo, the United Nations, our entire Aboriginal population and all Australian women. Making himself Minister for Women was a two fingered captain’s salute which rubbished fundamental notions of equality and mutual respect. Now belatedly he has spent $300 million on an awareness campaign which will only help to further line the pockets of media companies while refuges languish for lack of adequate funding. Prior conversation might have steered this decision away from guff towards practical assistance for those desperately in need of shelter. No victim of domestic violence needs a TV campaign to help her identify their abuse or abuser. Now Abbott is charging off to Victoria amidst a ‘war of words,’ in the ABC’s lexicon, with Daniel Andrews, leaving no doubt in anyone’s mind that young buck Daniel’s role is to agree with the old buck. It’s another classic conversation which essentially consists of ‘Tell you what I’ll do, and what you need to do, it runs, now let’s have a conversation to help you to agree with me. Sooky, Joe Hockey, the glassiest jaw on the front bench, currently provides a sublime example. ‘Ad hoc Joe’, privilege’s poster-boy, pocket neoliberal philosopher and stoutly loyal father, husband and son, is notorious for freely sharing his thought bubbles with an ungrateful world. Yet, $22,000 a year, will get you his undivided attention if you join his North Sydney forum. Hockey’s granting of privileged access at a price is a selfless gesture, he says, and a public good, part, perhaps of the largesse and noblesse oblige of entitlement. It’s a party fundraiser, he says. If it were not for such public-spirited generosity, the taxpayer would have to foot the bill. Others take a different view. The Age reported the fee for access practice in its brief to act as a public forum under a ‘treasurer for sale’ headline. Hockey sprang into defensive action, getting staff to ring the editor at 2:00am to demand an apology and to threaten defamation. As you do, when you would lead the national conversation. Now in court, Hockey wants compensation for his buggered reputation, caused, he claims, by the vile media report, inspired by ‘petty spite,’ malice and revenge, a conspiracy theory which quite baffles Fairfax. Walking and talking wounded Hockey and his entire family have been ‘devastated’ by The Age. Now his wisdom in seeking his own revenge only to expose what already seems to many as an oddly exclusive type of word in his ear is equally on trial. A poor witness, who needs reminding whose role it is to ask the questions, Joe, has confused the witness box with the dock such is his stress, Nonetheless, he must take every opportunity to remind the court that he is federal treasurer, part grandstanding but also voicing a deeper anxiety over his tenure. Joe claims he was not hocking himself to businessmen and lobbyists by flogging twenty-two thousand dollar a year subscriptions entitling business types to have a cup of Joe with the Treasurer in VIP meetings in private boardrooms via his North Sydney forum, a Liberal party entity. It’s all a storm in a tea cup. Why he can’t even remember names without Fairfax’s counsel prompting him. Who paid for an audience with Joe we shall never know because the list is confidential, the Treasurer reminds journalists, underscoring his own and his party’s notion that a good conversation was one where he controlled access to all the information and could readily withhold the bits he wanted hidden. A courtroom, however, is not a North Sydney Forum, what Hockey can only recall under probing questioning calls attention to another of his vulnerabilities in his job; a poor memory for names ill-becomes a man entrusted with the nation’s finances. The Age’s case rests on a reasonable assumption that those paying for Joe’s attention expect something special from him in return. Whatever the legal outcome of his NSF debacle it will cost Hockey dearly in credibility in his call for an open national forum. The idea of exclusive access to the treasurer can only add to suspicions of unfair influence. Bitter stoush with mortal enemy Fairfax, notwithstanding, Joe can’t resist another punt. When he should be comforting his family, preparing his testimony or preparing the next budget Joe, tears himself away to float his latest loopy idea of raiding our super to buy a first home. An attack on the basic role of super which would also push house prices even further out of reach of average wage-earners Hockey’s latest thought bubble threatens to bring the house down. But a pollie who hollers for a conversation is seldom bound by common-sense. Least of all, Joe. A paternal Paul Keating has kindly bought into the conversation to straighten out the wayward younger treasurer. Boofhead Joe’s latest idea is a dangerous dud, he makes clear. Hell-bent on calling for conversations, however, allows Joe no time to listen or respond. Or converse. Into the breach springs the loaded dog, aka PM Abbott who lately displays all the survival instincts of a Jihadist suicide bomber. Madly supporting everyone not moving against him, Abbott has rushed to back Hockers up before he tears himself away to put out a few spot fires he’s lit recently. It is difficult to converse when your foot is in your mouth. Yet shoot first, apologise later, is second nature to the captain. It does mean, however, Abbott has to mop up after one or two of his latest crap captain’s calls. Denial is his first tactic. The car industry call, he claims he took to the ERC, none of whom would ever disagree. Rapidly revising is also a favourite move. It wasn’t that much money. It was normal and proper. Further funding for auto and parts manufactures turns out to be a type of reverse magic pudding promise which begins as 900 million but which self-deflates in a day to one tenth of that if you are lucky. The wealthy multinationals who are the Australian car industry puzzle all the way to the bank. Hockey choked them to death last year yet now flings them some loose change he just found lying in his pocket. Pay for the drinks at their wake. The intergenerational report, already an entrant in the Miles Franklin award for fiction, also deals with loose change in the nation’s pocket, however much it is boosted in Hockey’s jawboning. Joe Hockey oozes protectiveness, then proposes we raid our super to buy our first houses, a move that could wreck countless young futures and push up house prices. What our leaders mean by ‘Let’s have a conversation’ is less than it sounds. And more sinister. This government has shown no capacity to consult; no ability to listen to mere mortals, so bound up is it in its worship of the holy free market, captains of industry and its duty of care to vested interests. Rupert Murdoch can cause Peta Credlin to be moved off stage but the recent United Nations’ censure over our mistreatment of refugees is dismissed by Abbott as wrong in substance and an unwanted lecture to boot. Express a dissenting view or even broadcast one and you will be overruled, attacked or ridiculed or all three as happened to Gillian Triggs. The record shows little sign of any government conversation skills or any other wherewithal for genuine dialogue whatsoever. Let me talk you round to my point of view; talk you into submission; talk over the top of you. Not, let me listen to your opinion with an open mind and heart. Not let me pay you the courtesy of consulting with you first and respecting your point of view. Such is the case with Morrison’s latest offer to compromise on lowering the pension. The proper time and place for a national conversation about the pension was at the last election. Instead the proposal to change the indexation method from being wage based to CPI, was simply proclaimed. The proposal aims to save the government billions over time but it cheats pensioners who struggle now to exist on the pittance provided by a resentful government by lowering the amount of their entitlement at a time when essentials such as utilities are set to rise steeply. But who knows, perhaps the boys can find another carbon tax to axe. Sponsoring the privatisation of utilities and cossetting energy producers has guaranteed price rises which will put utilities soon beyond the means of the average pensioner. We are, however, invited to a conversation after the government has declared its intention. Why, Scott Morrison MKII, the biddable, loveable saviour of drowning children and newly minted model of ingratiating affability is open to compromise, he says. The Abbott government simply does not communicate. Half-way through its term in office, it says, it is waking up to the need to listen to itself. If it’s true, it’s been a long and dangerous sleep. Wokka Entsch warbles contentedly now about how his party now listens to its own back bench. Perhaps he thinks we will hail its belated discovery of common-sense a virtue. Perhaps also he confuses listening with hearing. His optimism deludes him into believing that his leader will do anything more than grant him permission to speak. The Abbott government which has shown no capacity for dialogue whatsoever even with its own. For a conversation to succeed, you need to be able to listen. You need to be able to seek advice, then take advice, not brush it aside with a rubbishing of the messenger. Lenore Taylor in the Guardian lists several compelling cases where the Federal Treasurer has brushed aside significant and worthy contributions to the national debate, often with a sneer or ad-hominem attack, such as his gibe at the Greens. Calls for conversations have some unlikely politicians singing from the same crowded song sheet. But in a government which has no record of consultation and even less of a commitment to dialogue, or mutual respect, there is little more to it than a parroting of a new buzz word in a cacophony of double-speak spin as each clamours for our attention, each presuming our assent. Meanwhile, its leaders continue to draw attention to their own, singular unwillingness and lack of skill in listening or sharing. As they will until the next election gives the people their turn to speak. « Abbott and Hockey are playing Australians for fools in the IGR’s dog’s breakfast of lies and half-baked nonsense.